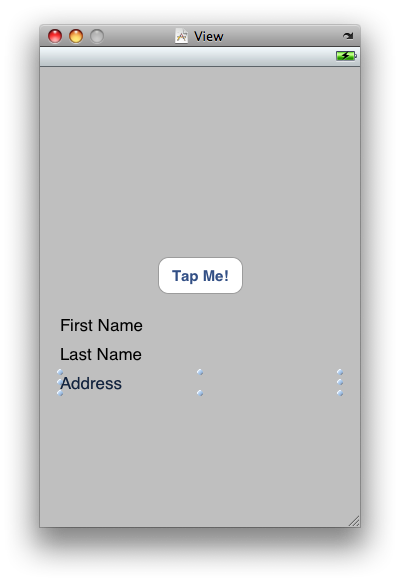 This is the first of what I hope to be several Cocoa Touch tutorials on this site. I was doing some furious Googling last night trying to find out how to get a contact’s street address from the Address Book for an upcoming update to Take Me Home, and I realized that it’s complicated and there aren’t any good tutorials online. So, after I figured it out, I commented it up so that hopefully, if you’re reading this, you’ll save some time that I didn’t. Before you read this tutorial, you should go through Apple’s excellent Address Book Programming Guide for iPhone OS. This tutorial will rely on the QuickStart application you write in the guide, so do that first. Add a new UILabel underneath the exisiting two. Be sure to go back into Interface Builder and connect File’s Owner in QuickStartViewController.xib to addressLabel. // Only inspect the value if it's an address. // Set up an NSArray and copy the values in. // Figure out which values we want and store the index. // Set up an NSDictionary to hold the contents of the array. // Set up NSStrings to hold keys and values. First, how many are there? // Set the address label's text. // Return to the main view controller. // If they didn't pick an address, return YES here to keep going. The first thing we do is define our ABMultiValue, multi, and copy the contents of the selected value into it. Then we define an NSArray, theArray, into which to copy the multiple values. But which one do we want? Each address has an identifier, which the method gives to us as identifier, but we reference them by index when getting them out of the array. So, we need to create an index (which we’ll store as an unsigned integer), theIndex, and set it to the return value of the ABMultiValueGetIndexForIdentifier function. Now that we have the index, we know which value of the array to store . They’re stored as type CFDictionary, which have key-value pairs for us to use, so we define an NSDictionary, theDict to put them into. First, we need to know how many key-value pairs there are, so we use the count method and store the return value in an unsigned integer, theCount. Be sure that this variable doesn&rquo;t change—you don’t want to assume that there are more members in the array than there actually are, as that can lead to nasty memory problems. For that reason I’ve defined it as a constant. Now, we define two NSString arrays, keys[theCount] and values[theCount], and then we’re ready for action. Next we use the NSDictionary getObjects: andKeys: function to copy the keys and values. The function copies the data, and we can construct our street address. For the purpose of this example, I’m going to make the address a single line, but you do with it what you want. Finally, we create a final NSString to put the formatted address into, pull the values out of the dictionary into the appropriate place, and we’re all done! Update 2010-07-27: Removed [ theDict release ];, some bad memory management.